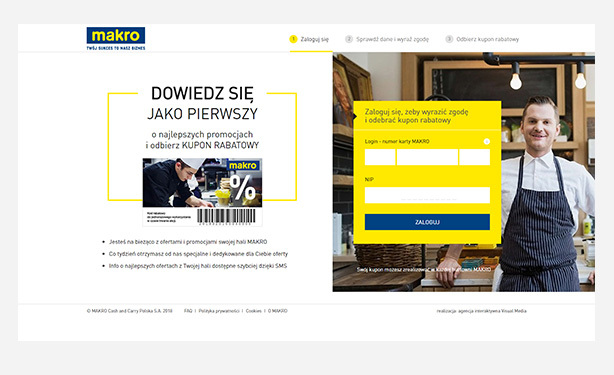 To provide Makro Clients with a new data management method, including marketing communication consents. 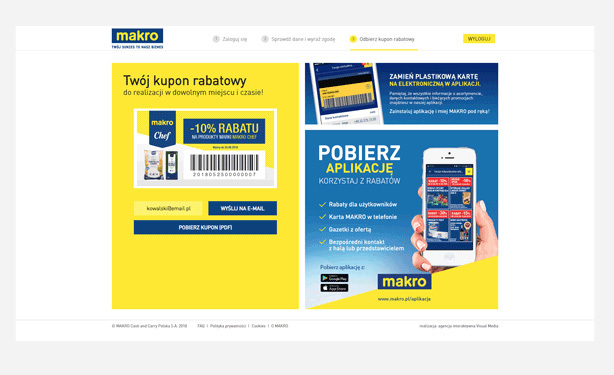 Compliance of the system with the GDPR regulation and Makro’s safety policy. The app should be a means to largely substitute direct contact with the Customer Service department. The key requirement is full process automation through integration with Makro's systems. Project implementation was preceded by performing an analysis and creating documentation in the business sphere, system creation architecture and legal requirements (GDPR). Works concerning further modifications resulting from the best possible adjustment of the system to applicable requirements were performed, firstly, using an interactive prototype and next, using a graphical layout. The implemented approach allowed for a smooth response to changes and the inclusion of several organisational units in the implementation process. Makro created the API integrated by our company with the designed application. This was the key element in terms of security. Additionally, a module based on, e.g. SMS API communication was created to detect abuse or errors connected with logging into the app. An application was created which facilitates data management in a user-friendly and simple manner and considerably enhances the Client - Makro contact process. The number of users of this data management method is growing. The choice of an electronic communication channel reduces customer service costs (e.g. printing of promotional newsletters, etc.). Potential for further functional development of Customer Service. We greatly value our cooperation with Visual Media during implementation of the project. We have received a solution fully meeting our expectations. During the project, we could also rely on VM team’s support and understanding.